The Canadian Radio-television and Telecommunications Commission today approved a nighttime power increase and pattern change for CFRA 580AM in Ottawa. The change will significantly improve the station’s signal, particularly toward the East, putting Montreal inside its 0.5mV/m contours at night. The result is a speech-bubble-shaped pattern pointed heavily toward the north, northeast and northwest (the transmitter site is due south of Ottawa). With these stations gone from this frequency, and no expectation that anyone would try to reactivate them in these small markets where there are still FM frequencies available, Bell Media Radio successfully convinced the CRTC that it should allow CFRA to increase its nighttime pattern to have better coverage toward eastern and western Ottawa suburbs at night. The fact that no one objected to the application also convinced the CRTC that this was a good idea. Under the approved technical parameters, CFRA will drop from 50kW to 30kW at night (instead of from 50 to 10). The pattern shape will also change slightly, still speech-bubble-shaped but a bit less directional toward the north, improving its signal toward the southeast and southwest. 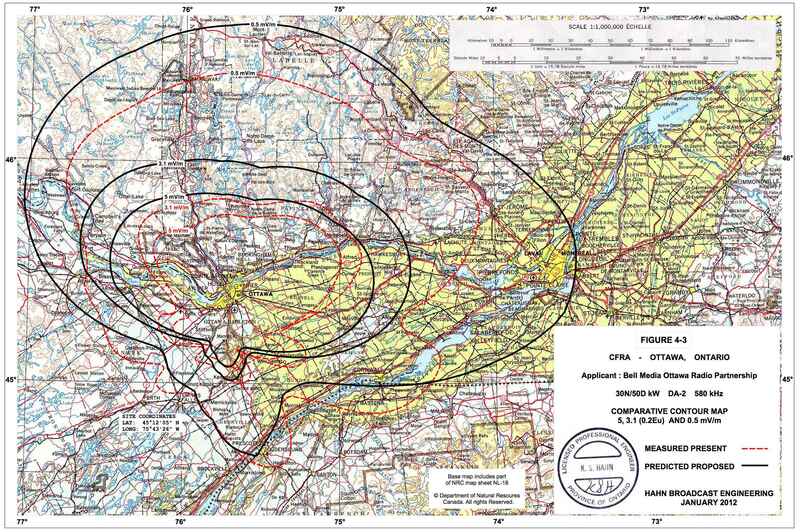 According to the broadcast engineer’s contour map, the 0.5mV/m contour, which under the current signal goes through Deux Montagnes, Rigaud and Alexandria, will now cover all of Montreal, Laval, the north shore and Châteauguay and Valleyfield regions. It’s hard to translate that into actual receiving abilities (which are dependent on the type of radio and local interference sources), but it will be an improvement. The group of three Montreal businessmen who want to revolutionize radio broadcasting by putting money back into it don’t yet have their first station on the air, but already they’re looking to expand their growing empire from two news-talk stations to up to five AM radio stations in Quebec, including sports-talk stations in English and French, I’ve learned. And that expansion includes an as-yet unpublished application to start a new radio station on a frequency with a lot of history for one of these partners. 7954689 Canada Inc. is the official name of the company founded and controlled by Paul Tietolman, Nicolas Tétrault an Rajiv Pancholy, and known as Tietolman-Tétrault-Pancholy Media (you can read more about them here). It was founded a little more than a year ago to apply to the Canadian Radio-television and Telecommunications Commission for two AM radio stations in Montreal, which would both have run on a news-talk format – one in English, the other in French. The French station was approved last October for 940 kHz, but since the other clear-channel frequency of 690 was given to CKGM and other frequencies were considered undesirable for the group, the commission turned down the application for an English station. The group has re-applied for an English station at 600 kHz, the former home of CIQC radio. The application was technically part of the hearings last week in Montreal that focused on Bell acquiring Astral Media, but since it did not provoke any opposition, there were no oral presentations about this application. Barring some unforeseen problem or change of heart, expect it to be approved quickly. With two big-power AM stations set to launch soon, possibly in early 2013, perhaps more realistically by the fall of 2013 (they have until October 2013 to launch the French one unless they ask for an extension), you’d think they’d have their hands full. But they’ve already set their sights on getting bigger. The group has taken part in two open calls for applications for new FM stations: one in Calgary for a hit music station and the other in Toronto for a news-talk station. Both had heavy competition and the group lost both times (decisions came for Calgary in May and for Toronto last week). But that’s not all. They’re also looking to expand here. Tietolman has previously said that his company might look to acquire existing radio stations as a result of the Bell-Astral acquisition that might force the divestment of an English radio station in Montreal. He has his sights on CJAD, but Bell said at last week’s hearing that if anything it would be CKGM (TSN Radio 690) that would be sold or shut down. Asked about the possibility of buying that station instead, Tietolman said “absolutely.” Since they already have an English news-talk station in the pipeline, this new one would probably maintain its sports-talk format. During the hearings last week, Tietolman was seen having brief conversations with executives at Bell, but whether these are of any consequence, I don’t know. When I asked the TTP group for their plans regarding sports radio, they were reluctant to share details, which I found odd for people who are normally very forthcoming with information. Was something in the works that hasn’t been made public yet? Turns out there’s at least one thing: the Industry Canada radio station database lists an entry for a Class B station at 850 kHz, dated Aug. 20, 2012 (updated Aug. 22), with a transmitter whose coordinates show it to be in the middle of a forest in Île Perrot. The company listed with that entry is 7954689 Canada Inc., or TTP Media. Applications for new radio stations have to meet approval of both the CRTC and Industry Canada. The latter handles the technical aspects of transmission, ensuring that the proposed station’s technical parameters meet regulations and do not interfere with other stations. An engineering report filed with Industry Canada is a step in the application process for a new radio station, but an entry in the database does not mean a station is authorized to begin transmitting. It’s merely a provisional entry, and it’s the CRTC that will decide if the proposed station will be given a licence. The CRTC tells me that indeed there is an application from 7954689 Canada Inc. for a radio station at 850 kHz in Montreal, but until it is published they cannot confirm any details about the application. A commission spokesperson said they could not say when a public notice about the application might come. Asked about this application, Tietolman confirmed that his group is applying to start a French sports-talk station at 850AM. The station would be 50,000 watts day and night, with a signal pattern that would cover the region but still provide protection for WEEI in Boston. Tietolman said the process began a year ago, when Cogeco announced it would move CKAC radio from sports-talk to all-traffic and well before Bell’s proposal to turn TSN 690 into an RDS radio station became public. Tietolman said they first tried buying another existing station (he wouldn’t say which one) to convert to sports-talk, but when that fell through they had their engineers find an unused frequency and signal pattern that could cover the region for a new application. It’s interesting that the frequency they came up with is 850 kHz. That channel has been silent since CKVL became CINF (Info 690) in 1999. CKVL was a major French-language commercial radio station for decades. It was started in 1946 by Corey Thompson and Jack Tietolman. The name is no coincidence: Jack Tietolman was Paul Tietolman’s father. Asked about getting back a frequency that used to belong to his family, Paul Tietolman said there wasn’t any sentimental value to the frequency, and it really was just the best one available. That’s not all. Tietolman also confirmed that TTP Media is also interested in acquiring CHRC in Quebec City, whose owners announced last Friday that they would be shutting the money-losing station down. Tietolman wouldn’t go into detail about what his group would do with the station, but expect it to be a sister station to the news-talk station being built in Montreal. Bell Media is also reportedly interested in acquiring the station, the last AM station in Quebec City. They would likely turn it into a sister station to RDS Radio, should the CRTC approve its application to put it on 690 in Montreal. Can TTP make sports radio work? I asked Tietolman how he thinks his group can make sports talk radio successful without rights to game broadcasts. He replied that play-by-play rights to live sports games like Canadiens and Alouettes have only a marginal impact on a sports-talk station’s overall profitability. It’s more of an image and brand thing than anything else, he said, and he said he was confident that they could make it work even without rights to those games. In English, Canadiens rights are held by Bell Media (which airs them on CKGM), while Alouettes and Impact rights are held by Astral Media (which airs them on CJAD). If the application by Bell to acquire Astral is approved, Bell would move Canadiens games to CJAD, and presumably Alouettes and Impact games would stay there. In French, Canadiens and Alouettes rights are held by Cogeco Diffusion, which airs them on CHMP 98.5. There is no French-language radio broadcaster for Impact games, which means either RDS Radio or a TTP sports-talk station could quickly pick up rights to Impact play-by-play. Those who considered TTP’s plans for their original two stations to be unrealistically optimistic will think this new expansion to up to five stations is just lunacy, an insane money-burning exercise that will leave the company bankrupt within two years. Those who think these three guys are going to save the radio industry will consider this great news. Expect the CRTC to be very skeptical about business plans once the 850AM application and any transfer of ownership applications come before them, just as they were when TTP’s original applications were heard last year. But don’t count out these little guys with a bit of money and big dreams, either. This was actually published by the CRTC in late August, but hasn’t been publicized much. It’s Bell’s response to comments filed with the commission against its application to transform TSN Radio 990/690 from an English station to a French one to meet its common ownership limits after the purchase of Astral Media (which owns CJAD, CHOM and Virgin Radio in Montreal). There were hundreds of comments filed, many from individual listeners (so much that the CRTC put up a special link on its home page to guide people through the process), but Bell responded to three. Why didn’t Bell request an exemption to keep four English stations? Bell doesn’t answer this very well, repeating that it has to follow the common ownership policy. But, of course, the point of an exemption is to get around that policy. It would be more sensical to point out that an exemption would give Bell four of the five English commercial radio stations in Montreal, and the commission is unlikely to grant that without a very good reason. Why can’t Bell run a bilingual station? The CRTC wouldn’t allow it, Bell says. And they’re right. For various reasons, the commission does not licence bilingual English/French commercial stations. Why doesn’t Bell sell the station? They could. They’re doing that to 10 other stations in markets where they’re going over the limit. But since they want an RDS radio station, they’re trying this so they don’t lose that key frequency. The official response is that “there is no certainty that a purchaser would commit to the all sports format over the long term; nor is there any way to enforce such a commitment, even if made, as the Commission does not regulate radio formats.” This is true, though it’s also true that Bell itself would not be committed to such a format. Shouldn’t 690 be reserved for an English station? There’s nothing tying this frequency to a particular language. It was the Radio-Canada station for decades, then Info 690. Last November, the CRTC issued a decision turning the historically French channel English and the historically English channel of 940 French. The two are coveted clear channels, with no special restrictions on nighttime power. The only other such channel here is 730, being used for all-traffic at CKAC. That said, Bell’s application to move CKGM from 990 to 690 was based in large part around how poorly the signal reached its core West Island anglo audience at night, when the Canadiens games are on. The commission could decide that this, combined with the fact that the other two clear channels are French-language, would be enough to either reject the application or issue an open call for applications to use this frequency. The entire response is republished below. Bell makes its presentation in the CKGM licence change Tuesday at 8am in Room 518 of the Palais des congrès, at which point it will release a separate document making its case for the change. The commission will hear from intervenors in favour and opposed until Friday, and then a response from Bell. The hearing is streamed live at cpac.ca, and on the CPAC TV channel as of 10am. This letter is filed by Bell Media Inc. (Bell Media) in response to the comments by Messrs. Pacetti and Scarpaleggia, the MPs for Saint-Léonard/Saint-Michel and Lac-Saint-Louis, respectively, and by Dufferin Communications Inc. (Dufferin) (collectively referred to as the Interveners). In the CKGM Application, Bell Media seeks the Commission’s authorization to convert our English-language AM sports talk radio station (currently operating as TSN 990) into a French-language sports talk radio station (to be known as RDS Radio). As set out in the Supplementary Brief filed with the CKGM Application, this Application is dependent on the Commission’s approval of the application filed by Bell Media for the acquisition of control of Astral Media Inc. (the Astral Application). In the event the Astral Application is approved, the CKGM Application is the necessary means by which Bell Media will ensure that it is fully in compliance with the Commission’s Common Ownership Policy. Before addressing the concerns of the Interveners, Bell Media would like to thank the many groups that filed interventions in support of the CKGM Application. As described in their comments, these interveners recognize that the conversion of CKGM from an English- to a French-language sports radio station will result in several distinct benefits to the Montréal radio market. With the Commission’s approval, CKGM will become Montréal’s Francophone sports authority, offering fans a radio option not currently available in the Montréal market. In his intervention, Mr. Pacetti, the MP for Saint-Léonard/Saint-Michel, asks the CRTC to permit Bell Media “to operate both a Francophone and Anglophone all sports radio station simultaneously” or “allow for the possibility of creating a bilingual station” so that “one community’s loss should not be another community’s gain”. While we sympathize with Mr. Pacetti’s desire for two sports radio options in each official language, this is simply not possible given the strict limits set out in the CRTC’s Common Ownership Policy. The Common Ownership Policy imposes a strict cap on the number of stations that Bell Media may own in Montréal and the conversion of CKGM is the means by which compliance with the policy can be ensured in light of the Astral acquisition. Another potential option would be the divestiture of the station to a third party. However, in a divestiture scenario, there is no certainty that a purchaser would commit to the all sports format over the long term; nor is there any way to enforce such a commitment, even if made, as the Commission does not regulate radio formats. Under these unique circumstances, we believe that transforming CKGM into a French-language sports talk radio station is the best option available to Bell Media at this point in time, as it will ensure that the Montréal market has the benefit of at least one all sports radio station, rather than leaving both the francophone and anglophone communities in Montréal without a sports talk radio station. It is also important to highlight that Montreal’s anglophone community will continue to receive coverage of sports in English as sports programming shifts from TSN Radio 990 to CJAD. Mr. Scarpaleggia, the MP for Lac-Saint-Louis questions why Bell Media has not applied to the Commission for an exemption to the Common Ownership Policy, noting that the English-speaking community’s interests are better served by having CKGM serve anglophone communities in Montréal. As set out above, Bell Media’s decision to convert CKGM from an English-language to a French-language sports talk radio station is required to ensure that Bell Media is in compliance with the CRTC’s Common Ownership Policy, which set outs very clear, unequivocal caps on the amount of radio stations that can be owned in one market. In the past, exemptions have been granted very sparingly. In its intervention, Dufferin argues that approval of the CKGM Application would call into question the integrity of the Commission’s licensing process with respect to the use of the 690 kHz frequency, which was awarded to Bell Media in 2011. In Decision 2011-721, the Commission approved our application for a technical amendment to move CKGM from 990 kHz to 690 kHz as a means of addressing severe reception problems caused by a defective signal. The primary purpose of the 2011 application was to rectify a severe signal problem by eliminating the need for CKGM to switch to a low-power night-time contour, which significantly reduced the signal’s coverage area. The technical amendment that was granted rectifies the signal problem, regardless of the language or format the station operates in. Thus, approval of the technical amendment, followed by a change in the station’s language of operation does not, in our submission, call into question the integrity of the Commission’s licensing process. We note that following approval of the technical amendment, CKGM could have changed formats and there would have been no basis for claiming that such a change affected the integrity of the Commission’s process. Moreover, should the Commission approve the CKGM Application, French-language listeners in Montréal would benefit immensely from the enhanced night-time coverage and signal quality that will be realized as a result of the previously approved technical amendment, especially in light of the fact that there are currently no French-language radio stations dedicated to sports news and information in Montréal. Thus, regardless of the outcome, Montréal listeners will benefit from CKGM moving from a defective to a clear signal. To support its position, Dufferin argues that approval of the CKGM Application and the Astral Application would allow Bell Media to operate six radio frequencies in Montréal and that this substantial concentration of ownership would redefine the playing field envisioned by the Commission in Decision 2011-721. We note that under the Common Ownership Policy, Bell Media is permitted to own the six commercial radio stations that would result from approval of the Astral Application and the CKGM Application. Thus the conversion of CKGM is entirely in compliance with the Common Ownership Policy and it is disingenuous for Dufferin to claim that ownership of a number of stations that is expressly permitted under the policy somehow constitutes excessive concentration of ownership. In fact, one party could technically own seven stations in Montréal (four French and three English) and still be in compliance with the policy. Dufferin also argues that approval of the CKGM Application would result in a major financial impact on the Montréal radio market. This claim is simply not credible. As is evident from the financial projections filed with the CKGM Application, Bell Media is projecting that it will experience a cumulative loss of over $12.6 million over the first licence term if the CKGM Application is approved by the Commission. Further, as set out in the Supplementary Brief filed with the CKGM Application, a comparison of the total retail sales and radio advertising revenues in the Montréal and Vancouver CMAs indicates that Montréal radio is underperforming relative to retail sales. Thus, there is upside potential for radio advertising sales in the Montréal French-language market if more radio format choices are offered. Therefore, contrary to Dufferin’s assertion, the CKGM conversion would not have a major financial impact. Instead, all indications are that it would have a stimulative effect on the French-language radio market by increasing hours tuned to radio. The decision to convert CKGM from an English-language to a French-language sports talk radio station has been a difficult one. Unfortunately, the limits imposed by the Commission’s Common Ownership Policy are such that the conversion of CKGM appears to be the best option available to Bell Media at this time, as it will ensure at least the ongoing presence of a sports radio format in Montréal. We are committed to continuing to provide Montréalers with a dedicated sports radio station and creating a vibrant Montréal radio market, while working within the parameters of the Common Ownership Policy. We trust this responds to the Interveners’ concerns. A copy of this letter has been served on the Interveners, in accordance with the CRTC’s Rules of Practice and Procedure. UPDATE (Sept. 11): Bell presented its case in person to the commission Tuesday morning. You can read its prepared notes here (PDF), and my story summarizing the hearing for The Gazette here. Here’s me holding my keys. Among them is my Bixi key. It’s scuffed up, and is now completely useless. And I couldn’t be happier. As the CRTC was in the middle of an odd three-hour break on Monday, I headed out to grab some food and head to CBC for a radio interview. I took a Bixi to a Belle Province on Ste-Catherine Street, and had a quick bite. When I got out, I went back to the Bixi stand, but I couldn’t find my keys. Not in the usual pocket, not in the other pocket. Nowhere. They weren’t back at the resto. But I had to have had them when I got the Bixi at the Place d’Armes metro station. My conclusion: I must have left the keys in the Bixi stand at Place d’Armes. The Bixi key isn’t a problem to replace. Call them, they deactivate the old one and charge you $5 to send a new one by mail. The other keys are more annoying to replace. One of them I’m not even sure there’s a double for, plus I would need someone to let me into my apartment. A hurried cab ride (I never take cabs) back to Place d’Armes confirmed the keys were no longer there. I went to the interview, walked back to the Palais des congrès and continued my day, stressing about how I would get into my home that night and how I would replace all those keys. I got a phone call, which I ignored because I was in the middle of a hearing. Then I saw a tweet a minute later: Someone had found my keys, called Bixi and left their number. The young man, who lives in the Plateau, was happy to return my precious bits of metal, and gave me his address to pick them up. He hesitated when I offered a small reward, to the point where I literally had to shove it in his face. I asked him to do something enjoyable with it, and after trying again to refuse he said he’d put it toward his trip to Quebec City. Unlike a wallet or a cellphone, those keys are pretty useless to anyone who’s not me. It’s not like it’s easy to figure out what they open. Big thanks to the man who found my keys, and to Bixi, which not only processed my request to have the key deactivated in a matter of seconds, but went above and beyond in reuniting me with my keys later. As part of an expanded benefits package presented to the CRTC in its proposed purchase of Astral Media, Bell on Monday said it would create a French-language all-news specialty channel based in Montreal that would compete with LCN and RDI. You can read more in this story I wrote for The Gazette. Nothing is set in stone yet. They haven’t even applied for a licence, and will wait until a decision comes on the Astral purchase to do so, since this would be contingent on the CRTC accepting the purchase. But Bell’s plan, should the CRTC accept it, is to put $20 million of its tangible benefits package toward the creation of this channel. Bell Media President Kevin Crull clarified that the funding put into the network would be far higher than that, particularly at first. The network would be the third French all-news channel in Canada, behind RDI and LCN. That alone has some wondering if the market can support it. Bell made it clear at the hearing that it had no plans to do this before Astral came into the picture. Apparently it was Astral’s idea, in fact. Crull said that the channel might launch some time in 2013. Considering the delays involved, I would suspect no earlier than fall 2013, and even then I think that’s optimistic. No plans are set as far as things like how many bureaus there would be or what kind of equipment they would have. We just know it would be based in Montreal. Either way, the addition would be good for CTV’s Montreal news operation if the two sides share resources like Radio-Canada and CBC do. The ability to get video from Quebec’s regions is one of CBC Montreal’s main advantages over CTV. But this is all speculation at this point. If the CRTC rejects the Astral purchase, this project dies. And it’s not a given that CTV and this new channel would do resource-sharing, even if that would make a lot of sense. This news also brings up some interesting thoughts about Bell’s future in Quebec. Bell was asked at the hearing how it would compete with Quebecor’s TVA, whose strength is in conventional television, if they don’t own conventional over-the-air TV stations in French Quebec. Bell said the line between conventional and specialty television is getting blurry. A Bell takeover of the V television network, which is currently owned by Remstar as an independent player, might make sense with this new channel. The two could also share resources or even be co-branded, and V could go from being a non-factor in local news to being a serious competitor for TVA and Radio-Canada. Bell potentially buying V has been rumoured and speculated for a while now, particularly since V started showing a profit. But Bell might be hesitant trying to justify another major acquisition before the CRTC. This is it, folks. The Canadian Radio-television and Telecommunications Commission begins hearings at 9am into Bell’s proposed $3.38-billion purchase of Astral Media, and a related application to convert CKGM (TSN Radio 690) from English to French. The hearings will be broadcast live at CPAC.ca and even covered live on the television channel as well. The CRTC also has its own audio feed of the hearings. Each is offered in both languages. And, of course, I’ll be covering them as well. Stay tuned here for updates as they happen. Follow me on Twitter. That’s easier. In the meantime, you can read my piece in Saturday’s Gazette about the war over specialty channel carriage contracts, and my other piece setting up the hearings. Almost three years after joining what was then 92.5 the Q, Murray Sherriffs is about to be unemployed again. Sherriffs said he was told on Sept. 1 that the station was looking for a “different sound” and that he was being let go. His last day is Friday, Sept. 14. It’s unusual that an on-air personality (particularly an opinionative one like Sherriffs) would be kept on for two weeks after being told he’s being canned. I don’t know if it speaks to the professionalism of Sherriffs or of management at Cogeco that he’s being allowed to work these two weeks (and, presumably, will get a chance to say goodbye). Sherriffs says he and Beat program director Leo Da Estrela are friends, the departure is being handled with all professionalism. Sherriffs joined the station that became The Beat in 2009, after he was similarly let go from CJFM as part of its rebranding from Mix 96 to Virgin Radio. I can understand the reasoning that Sherriffs’s deep authoritative voice might not fit in with the cheery, up-tempo sound of The Beat. But his voice is unique enough that he really should have a voice in radio somewhere. It’s bad enough Pete Marier is still looking for a job. Unfortunately, the lack of competition in Montreal English radio limits Sherriffs’s options. Once Bell takes over Astral (and if its plans for CKGM are approved), there will be only two players in town in commercial English radio, and Sherriffs has been let go from both, apparently merely because his sound didn’t fit. There’s hope on the horizon with an application in front of the CRTC for a talk radio station at 600 AM by the Tietolman-Tétrault-Pancholy group. That application is being considered at the CRTC hearing that begins Monday (it’s a non-appearing item, so there won’t be discussion of it). It will be weeks, perhaps months before it’s approved (though approval is likely), and not until 2013 that it begins operation. And there are just so many out-of-work veterans from other stations they can pick up. Beat program director Leo Da Estrela confirmed that Sherriffs is leaving on Sept. 14 and that they’re looking for someone to replace him, but didn’t give any further comment.